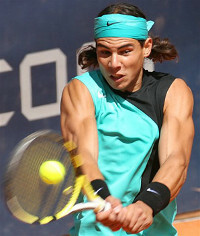 Dominating wins in major tournaments earned Spanish tennis star Rafael Nadal and American golfer Cristie Kerr the United States Sports Academy’s June Male and Female Athlete of the Month honors. Nadal, the world’s No. 1 men’s tennis player, won his fifth French Open in six years and won every match at Roland Garros in straight sets for the second time in three years. Spain’s “King of the Clay Court” has won every major clay court tournament this year (French Open, the Mutua Madrilena Madrid Open, the Monte Carlo-Rolex Masters, and the Internazionali BNL d’Italia in Rome). Cristie Kerr was named Female Athlete of the Month after she won the LPGA Championship by 12 strokes, the largest margin of victory in the history of the tournament, and tied for second with the biggest margin in any LPGA major. She also won the LPGA State Farm Classic with a score of 22 under par, a record low for that tournament. Finishing second to Nadal for Male Athlete of the Month was Kobe Bryant. The Los Angeles Lakers’ guard was named Most Valuable Player (MVP) of the NBA Finals after averaging 28.6 points per game in the finals and 29.2 per game in the playoffs. Arizona Diamondbacks pitcher Edwin Jackson finished third after pitching a no-hitter in a 149-pitch performance in a 1-0 victory over the Tampa Bay Rays. Second place in the female ballot went to Queen Harrison, who won the NCAA Championship in the 100-meter hurdles with a time of 12.67 seconds, and won the 400-meter hurdles in 54.55 seconds. The Virginia Tech senior and 2008 Olympian was the first woman to win both hurdle events at the NCAA championships. Coming in third was Chaunte Lowe, the women’s overall champion at the U.S. Track and Field Championships, who won the high jump by clearing 6 feet, 8.75-inches, an American record. The public is invited to participate in the worldwide Athlete of the Month nominating and balloting processes. Visit the Academy website and fill out the nomination form, and return to the website on the first week of each month to vote on the Athlete of the Month. Winners will be announced on the Academy’s website and in the online edition of the Academy Update.